Hat circumference is 22 inches [56cm] to fit head sizes 21-23 inches [53-59cm]. Many spindle whorls are decorated with little circles, and so this hat is covered with many circles created by crocheting the traditional Catherine’s Wheel stitch pattern and then outlining the circles with chain stitch. The hat name is a bit of a pun on the traditional stitch pattern name: whorl because of spindles; Katherine in honor of the five women named that in my knitting group who all spell it with a K.
I wanted to combine several of the crafts that use yarn, so I embroidered my circles and knitted the brim (instructions for an alternate crochet brim are provided). Use surface crochet to create much the same effect as the embroidery. I’ve found that crocheting with a single strand of yarn and knitting with the same yarn doubled makes the two match up well in terms of both stitch gauge and appearance. I made use of that principle in this hat. This pattern is intended for confident crocheters. No in-depth tutorials are provided. Crochet: 41 sts (4 motifs) and 14 rows in a Catherine’s wheel swatch that was 6 inches [15cm] wide by 4 inches [10cm] high. Knitting: 20 sts and 28 rows over 4 inches [10cm] in stockinette stitch with yarn held double. Color A: 306 yards [280m]. Isager Strik Højlandsgarn (Highland Yarn) was used for this hat. Color B: 14 yards [13m]. This was yarn unraveled from a sweater. Isager Strik Højlandsgarn or Jamieson & Smith 2-ply jumper weight would be good substitutions. Spinning specifications: unwashed singles: 24 wpi; washed and finished 2-ply yarn: 12wpi. Grist: 2009ypp. US size D [3.25mm] crochet hook, or size needed to get gauge. US size 6 [4mm] knitting needles for working in the round, or size needed to get gauge. Crochet: you need to know how to slip stitch, chain stitch, single crochet, double crochet, decrease, seam, work through the front or back loop (if you work the alternate crochet brim), make invisible joins, and do optional surface crochet (if you don’t embroider the circles). US terminology is used. Knitting: you need to know how to work with two strands at once, pick up and knit, knit in the round, and graft. Embroidery: you need to know how to chain stitch (substitute surface crochet, though there will be more ends to work in). 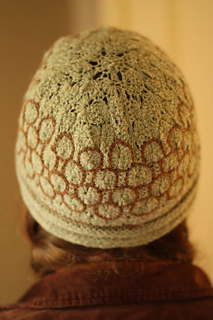 Another likely substitute for the knitted welting is the crocheted welting in this tutorial. Please note: I am no longer able to crochet, so I haven’t tested this technique - but it looks plausible.